Two-wheeler exports from India clocked a record high since 2011-12 at 2.8 million units, registering a 20.29 per cent year-on-year (y-o-y) growth, riding primarily on motorcycle exports. The country exported 2.81 million two-wheelers in 2017-18, of which, 2.4 million or about 88 per cent were motorcycles. Scooters comprised about 11 per cent of the total exports at 314,307 units, growing at 7.34 per cent y-o-y. Moped exports, however, slipped 13.6 per cent to only around 17,412 units. As such, the TVS XL 100 from the TVS stable is the last man standing in the mopeds category in the country. But it, too, saw domestic demand slip 3.5 per cent during 2017-18. Subrata Ray, senior group vice-president at ICRA, said the growth in exports was primarily on account of geography additions over the years and enhancing market share in these geographies. “Also, players such as Hero MotoCorp and Honda Motorcycle & Scooter India (HMSI) have taken to motorcycle exports in recent years. And they added to the volumes,” he added. In the scooters segment, HMSI accounted for over 60 per cent of the total scooter exports at 189,438 units during 2017-18, a 16.5 per cent y-o-y growth. He added that HMSI was not only leading the ‘scooterisation’ in India but was also driving the trend in other markets, especially the SAARC nations. The company is also mining new opportunities in the ‘style-conscious youth’ segment in Latin American countries with its Navi and motorcycle CB Hornet. India Yamaha Motor, too, saw a 45.5 per cent y-o-y rise in scooter exports during the year, riding on its fuel-efficient variants Cygnus Ray and Fascino and exported 43,025 units in 2017-18. For motorcycles, Bajaj Auto was the undisputed category leader with exports to 70 countries. Bajaj exported 1.39 million units of motorcycles during the year, a 56 per cent share of total motorcycle exports. Bajaj clocked a 15 per cent y-o-y growth in exports on a high base. 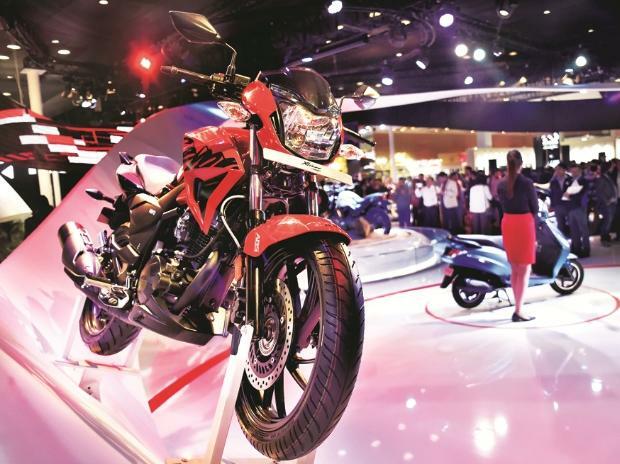 Rakesh Sharma, president of international business at Bajaj Auto, said a combination of factors were responsible behind the export growth — entering new markets, enhancing market share in existing ones and an increased acceptance of the Bajaj brand and its proposition. Sharma added that exports were primarily driven by three models, Boxer, Pulsar and CT. The Pulsar brand, which has seen 13 refreshes since its launch, sold more than 10 million units globally over 16 years in December 2017. Hero MotoCorp, too, saw a 27 per cent rise in exports of motorbikes in 2017-18, selling 178,156 units overseas. HMSI exported 159,152 units of motorcycles during the year, a growth of 32 per cent.